Industrial networks have long been plagued by interoperability issues stemming from a mix of proprietary communications technologies, even within single families of standards such as Ethernet. If not rectified, this incompatibility will slow the adoption of Industrial Internet of Things (IIoT) rollouts that must be able to communicate across layers of network infrastructure to be effective. 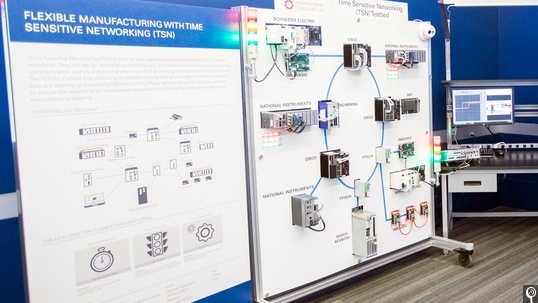 In January 2017, National Instruments (NI) opened the NI Industrial Internet of Things (IIoT) Lab at their headquarters in Austin, TX to evaluate the ability of Time-Sensive Networking (TSN) technology in solving these issues. Supported by industry organization Avnu Alliance, TSN is now positioned as the common infrastructure solution for next-generation networks that provides both a migration path for legacy systems and the opportunity for new IIoT use cases based on big data analytics operating in the enterprise. In the IIoT space, communications protocols, controller hardware, I/O components, processing elements, and software platforms are combined to validate end-to-end solutions that will dramatically change the way businesses operate. However, as the IIoT grows, manufacturers are challenged with automation and control systems that are now burdened with trying to connect an increasing number of pieces and parts. If the IoT is to continue to advance in industrial settings, a solution that ensures interoperability within these networks is crucial. New capabilities and opportunities across industrial settings bring a need for streamlined operational and manufacturing models. As awareness surrounding IoT standards continues to grow, industry stakeholders are being drawn to the necessity of interoperable network infrastructure built on Time-Sensitive Networking (TSN). TSN is an IEEE standard that solves time-critical communications and data processing tasks through a robust Ethernet/IP-based technology that reduces communications latency and ultimately provides a foundation for more advanced manufacturing based on data that can be flexibly shared between layers of a control system. Its value is derived from simplifying the convergence of operational technology (OT) and information technology (IT) networks, as TSN can provide precision timing for industrial applications alongside interoperability with enterprise systems to unlock the IIoT promise of improved operations driven by big data analytics. For the IIoT, TSN will form the foundation for interoperable ecosystems comprised of multiple manufacturers, protocols, and organizations that are all able to share the same network infrastructure and thereby improve productivity and resiliency. Ethernet-based technologies gained popularity over time as a way to leverage advances in processing, communications, software, and system design originating in the consumer world. Unfortunately, the limitations of standard Ethernet also resulted in technology fragmentation as variants of the technology were created to meet the real-time requirements of measurement and control applications. These variants often included modifications to hardware and structural components of the Ethernet stack to guarantee performance, minimize latency, and eliminate packet loss, but in doing so sacrificed interoperability with standard Ethernet and thus became much more difficult to access across networks – if at all. In addition, certain modifications prevented systems from evolving with current Ethernet standards, limiting their bandwidth capacity over time. Many of the control systems and applications in today’s factory automation, power generation and distribution, and oil and gas sectors, among others, are based on such non-standard Ethernet technology. Unlike the proprietary modified variants of Ethernet, TSN and related efforts such as the IETF’s Deterministic Networking (DetNet) initiative provide mechanisms to extend these systems and applications based on a standard that facilitates OT/IT convergence on a common physical network. TSN, for instance, has the potential of integrating with existing applications as well as standard IT traffic, providing a migration path for legacy industrial equipment transitioning to the IIoT. IIoT technologies, solutions, and systems architectures based on TSN must be vetted against real-world challenges before they can be deployed in industry settings. In light of this, NI’s IIoT lab in Austin, TX houses the Industrial Internet Consortium (IIC) TSN – Flexible Manufacturing Testbed (also known simply as the TSN Testbed), which serves as both a working showcase and interoperability testing center for TSN technology. The TSN Testbed was developed with two major goals: to show TSN’s market readiness and illustrate the business value of TSN adoption (Figure 1). IIC member participants in the TSN Testbed include Analog Devices, Belden/Hischmann, Bosch Rexroth, B&R, Cisco, Hilscher, Intel, KUKA, National Instruments, OPC Foundation, Renesas Electronics, Schneider Electric, SICK, TTTech, and Xilinx – many of whom are also members of the Avnu Alliance and all of whom recognize the value in creating an ecosystem around TSN standards to bring high-performance, low-latency communications to manufacturing applications. The work coming out of the TSN Testbed is already having a direct impact on suppliers and manufacturers, as it can be used to demonstrate the viability of real-world solutions. For example, two large-scale robotics and automation control suppliers are currently using the Testbed to evaluate how TSN technology can increase interoperability between their systems. The test case involves coordination and control of programmable logic controllers (PLCs) and monitoring sensor data passing between the PLCs and robotics platforms. This requires high levels of determinism and synchronization to facilitate commands between the sensors, PLCs, and other devices on the network within strict time schedules. Without TSN, these suppliers would be forced to perform such communications using proprietary networking technologies that may not interoperate and contribute to vendor lock in. The majority of existing projects in the TSN Testbed are scheduled for completion this year and will be formally adopted into the TSN standard, while several TSN sub standards are also under development. Intel silicon and drivers, National Instruments controllers, and network switches from Cisco and TTTech are among the industrial TSN products already available to customers, with several more scheduled to launch in 2017. TSN and Avnu Alliance: Why now? In 2015, Avnu Alliance member General Electric (GE) predicted that investment in the IIoT is expected to top $60 trillion by 2030. This means that the need for interoperability between devices and subsystems on the network will only continue to grow. As a key collaborator in the TSN Testbed, sponsor of the IIoT Lab, and the independent certification body for conformance and interoperability of TSN and related standards, Avnu Alliance is invested in the continued advancement of Ethernet through TSN technology. To support TSN rollouts across various vertical markets, Avnu Alliance helps develop and disseminate open source software, hardware reference designs, and test plans that verify the correct implementation and operation of TSN-enabled products. These efforts ensure that the underlying mechanisms of a common TSN infrastructure platform meet industry requirements, allowing vested interests from the industrial sector to build out device connectivity and onramp new business opportunities. The industrial segment of Avnu Alliance includes member companies from across the entire ecosystem and supply chain, including IT vendors, silicon providers, and industrial suppliers, all working together to create an interoperable ecosystem of low-latency, time-synchronized, highly reliable networked devices. Avnu Alliance also coordinates with organizations such as the IEC, IEEE, IETF, ODVA, OPC Foundation, and IIC to ensure that multiple protocols and manufacturers are able to coexist on the common foundation of TSN networks. As the TSN standard matures and the technology is deployed into the IIoT market, Avnu Alliance certification processes will continue to evolve to support forwards and backwards compatibility. This is the foundation for future-proofing investments and proving out cost benefits to end users of next-generation IIoT networks and the nearly limitless potential they will provide. Todd Walter is Chief Marketing Manager at National Instruments and Industrial Segment Chair for Avnu Alliance. Tom Weingartner is Marketing Director for Deterministic Ethernet and IIoT Communication Technology at Analog Devices and an Avnu Alliance member. 1. 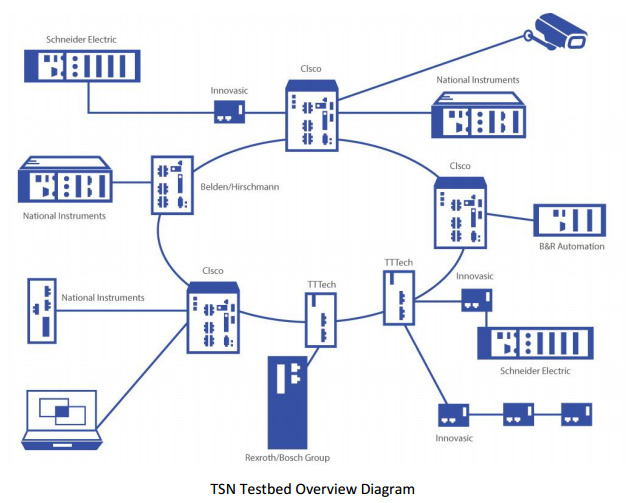 “Time Sensitive Networking (TSn) Testbed.” Time-Sensitive Networking Testbed | Industrial Internet Consortium. Accessed March 29, 2017. http://www.iiconsortium.org/time-sensitive-networks.htm.